AIPMT Re-exam Admit Card 2015 Download CBSE AIPMT Re-exam Date Hall Ticket Check CBSE AIPMT Re-exam Call Letters 2015 www.aipmt.nic.in. 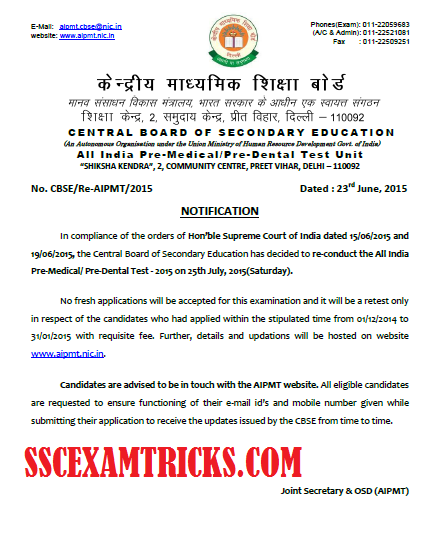 Latest News - The latest news is that CBSE has released online admit card for re-examination on 09th July 2015 on official website. You can download your online AIMPT admit card for re-examination by login your account. 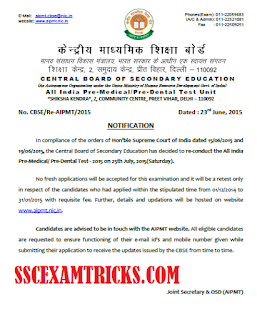 AIPMT Re-exam Date Declared: Central Board of School Education has declared All India Pre-Medical Test Re-exam date in press conference held on 23rd June 2015. According to resources, AIPMT Re-Exam is going to be held on 25th July 2015 at various centres in all the country. CBSE declared that candidates must check their email and update their mobile number (which was registered during online application for AIPMT 2015) regularly for the further instruction to be released by the board. CBSE has also advised to the candidates about the regular visit to official website to check for regular updates. CBSE will release AIPMT Admit Card Re-exam 2015 on 15-20 days before the dates of re-exam on the official website. Approx. AIPMT Admit card Re-exam 2015 will release in 8th-10th July 2015. Candidates can download AIPMT Admit card Re-exam 2015 when it gets released on official website. Sscexamtricks.com will cover regular update regarding AIPMT Admit Card, Exam Analysis, Answer Keys, Result, Scorecard and seat allotment Admission to the selected candidates. AIPMT re-exam CBSE will conduct re-examination on 1050 centres in which 6.5 lakhs candidates are going to appear for total 3800 Medical Seats for admission to MBBS / BDS courses in Government and Aided Colleges in all over the country. The latest news is that AIPMT Centres will be install Mobile Jammer and Biometric Machine at the gate to get entry for conducting re-examination by the candidates. It is also in news that at some centre (about 100 exam centre) mobile jammer and biometric machine will install for the purpose to remove the cheating in AIPMT Re-examination. Mobile phone Jammer will remove mobile network connection up to distance of 500 meters and biometric machine will exam the originality of the candidates. Mobile phone jammer remove bluetooth, GMS, CDMA, and Wi-Fi Signals coming to AIPMT re-examination centres. There will be no provision to upload or downloading any data in this range of mobile phone jammer. Wireless Codes Wing will also be considered for the selection of effected areas during AIPMT Re-exam. Besides this AIPMT Re-examination hall ticket will be checked by the duty officers at the entry gate of examination centres. In this way, Cheating will be removed from AIPMT Re-examination 2015. From the resources, it is advised by Police to CBSE for metal detector checking, Scanner, Jammer to test / check every candidates. It is also advised to provide random centres to every candidates who is going to appear in AIPMT Re-exam 2015 which will be rescheduled to 25th July 2015.This arrangement is advised to eliminate the chances to cheat in this examination. The Final decision will be taken by CBSE board about the arrangement to conduct AIPMT re-examination 2015. · Purpose of Exam – To get Admission in MBBS / BDS Courses in reputed and renowned Medical / Dental Colleges in all over the country. · It is mandatory to produce AIPMT admit card 2015 (downloaded by website and printed Hard copy affixed with Colored passport size photograph) before getting entry into the examination hall. · No candidate will be permitted to appear in the examination without AIPMT admit card 2015. · AIPMT 2015 Admit card will be checked along with valid photo identity proof of the candidates at the venue of written examination by duty officers. Final selection for Seat Allotment Admission of the candidates - On the basis of candidate's performance in the online examination and cut off Merit List of the candidates through counseling process.